So this is weird... my dad died about 2 weeks ago. It's really strange times. Half of me for most of my life has been prepared for this moment to come due to his alcoholism and the other half of me is like sad / sorta angry but subdued, like its dulled out in the far distance. It almost feels like it didn't happen sometimes. It is a very weird and awkward space to live in. I just want to watch and talk about Twin Peaks all the time recently so I guess that is how I'm coping. Coping seems like a strong word but Twin Peaks is just my solace right now. First off, the finale is tonight people. I CANNOT WAIT. Even if we wrap up nothing and it was all unconnected dream logic I don't even care. I am obsessed with the imagery of Twin Peaks. The show has a very weird color pallet of muted and jewel tones. It evokes a natural and ancient kinda of feeling with its sound-work and how vast everything feels with the wide open shots. I just love it. The characters are the best part and they've made me step into fan art. This is art just for me, not even to display just for me just put it on paper. I don't know why that is even a kind of artwork for me now, it used to be art to sell art to learn, and art to experiment. I had this a little bit with Big Little Lies, where it was like omg they're so gorgeous I just have to put them in my sketchbook, but Twin Peaks bringing it to a new level. I just love drawing them. So Candie wears this amazing just pepto -bismol pink cocktail dress and nylon gloves OMG its just so good like the costume and her totally space cadet personality thing going on, its just so great. I need to start bringing more colors to work because I actually love this sketch but wish it had that intense pink in it. I am really into sketching more cartoony stuff at work lately, like I love this. I've also noticed sketching more cartoony helps me loosen up. Mentally and physically well physically as far as art wise. It helps my artwork feel more loose and natural and not overworked? I've been wanting a pin up tattoo on my thigh for a long time, it will probably be a while before I get it done anyways but I am in love with this Laura Palmer pin up. I've always thought of doing a pin up calendar sometime but don't know what kind of market there is for that kind of thing anymore. I also tried my watercolors on this one, I am still pretty new to the media but I love how trees look in watercolor, like fading in the distance. 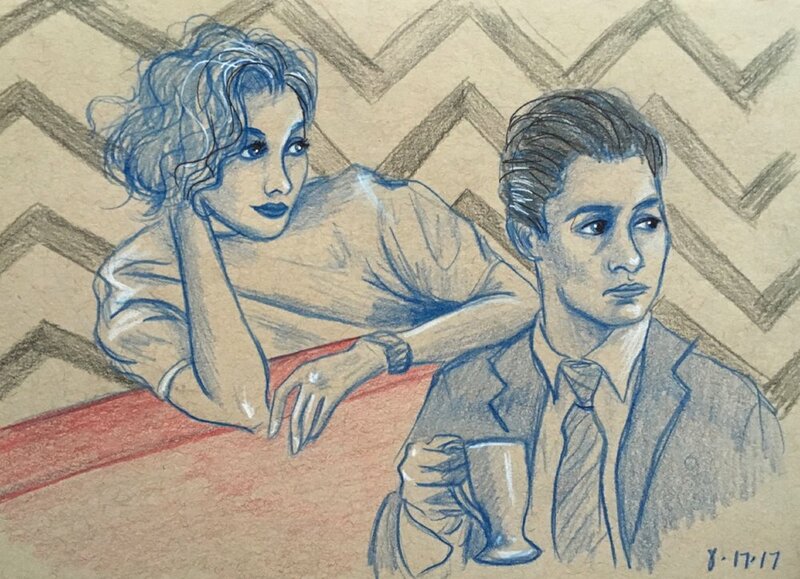 Or if I never get around to getting it tattooed I might hang this one just cos I love it I rescind my past statement about not displaying it, because how cool would it be in my Twin Peaks themed den in my future imaginary house when I decorate it. Not that I directly asked, but I recently had a little diatribe about my disatisfaction of art education and availability of truth and helpful information for artists. Low and behold, while youtube searching for ''artist success" I came across a video series made last year about just that. He is an established sucessful arist and he is sharing what he has learned and putting it out there in a non-condescending, totally accesible way. He's not just talking about the personal/mental side of what it takes, he's doing videos about acutal art composition. I also like that he doesn't stress any particular style and sends the message that there is room for any style of artwork in the art community, as long as you put in the work. Which is refreshing to hear.